Include 1 pcs Original, 1 pcs Chocolate & 1 pcs Durian flavour Hokkaido Baked Cheese Tart. 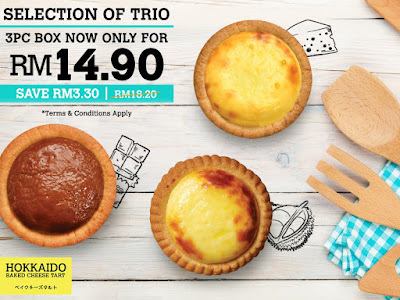 Valid from 27 March - 23 April 2017 at all Hokkaido Baked Cheese Tart outlets in Peninsular Malaysia only. Not valid with other on-going promotions and offers. Pricing is inclusive of 6% GST where applicable.